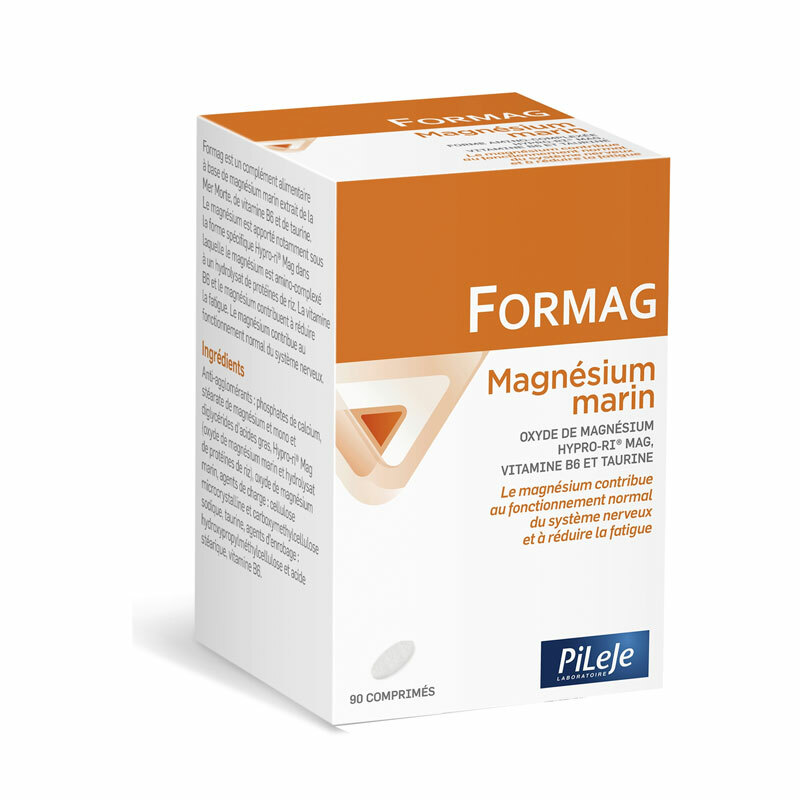 ﻿ PILEJE FORMAG 90 TABLETS 150 mg Magnesium bioavailable cp Formag! Pileje Formag is recommended in case of prolonged magnesium deficiency (lack of energy, sleep disturbances, sensitivity to stress). Magnesium is an essential substance in many processes in our body. Magnesium is necessary for the operation of muscles (including the heart), vessels, our skeleton, the immune and nervous system. 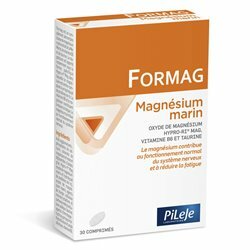 Recent scientific studies have shown that 7 out of 10 French have insufficient magnesium intake: it is for this reason that PILEJE laboratories have developed nutritional supplement FORMAG, providing bioavailable magnesium grace substances optimizing its absorption by the body . Nutritional Supplement FORMAG mainly contains bioavailable magnesium. Each tablet contains 150 mg of magnesium is 100% of the Recommended Daily Intake for taking 2 tablets FORMAG. Formag also contains Vitamin B6 and Taurine which optimizes a better assimilation of magnesium in the body. The magnesium content in the dietary supplement Formag is 100% available for your shape! Bioavailability almost perfect avoids the classic side effects occurred with other formulas complementation magnesium (digestive disorders, diarrhea ...). During 45 to 90 days, swallow 1-2 tablets daily with a full glass of water. Avoid concomitant use of tea or coffee. Hypro-ri ® mag (magnesium oxide marine and rice protein hydrolyzate), anti-caking agents: calcium phosphate, magnesium stearate and silicon dioxide, agents: microcrystalline cellulose and carboxymethylcellulose sodium, taurine, agents coating: hydroxypropylmethyl cellulose and stearic acid, vitamin B6. When Formag PiLeJe is it advisable? Formag is composed of magnesium extracted from seawater and vitamin B6 that contribute to the normal functioning of the nervous system and reduce fatigue. Magnesium also contributes to normal muscle function. Exclusively provided by our diet, magnesium is an essential mineral found in almost every cell. However, according to Su.Vi.Max study, 7 out of 10 French have magnesium intakes below the Recommended Dietary Allowances. Formag is formulated based on a specific ingredient Hyprori mag ® combining magnesium from seawater and amino acid fractions (rice protein hydrolysates).